THE BEST SCRABBLE EVER, DESIGNED JUST FOR iPAD! Enjoy the fantastically fun game you know and love with stunning HD-quality graphics, quick, easy play and incredible exclusive features. 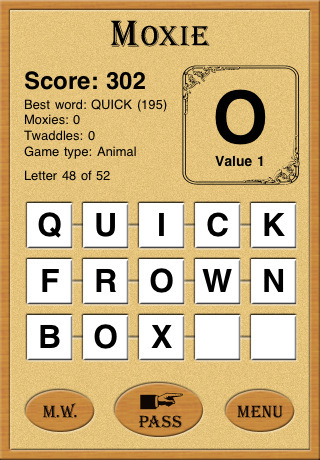 America’s favorite word game is now an iPad essential! Connect with friends on Facebook* and play up to 25 games at a time, square off via Pass N’ Play, or Local Network Play. Any way you play it, SCRABBLE spells more F-U-N for everyone! wurdle is a fun, flexible and fast-paced word game, perfect for coffee breaks or the subway. Find and trace as many words as possible before time runs out. Can’t find any more words? Shake the board to mix up the tiles! Customize wurdle the way YOU like it, and see how you measure up against your friends and the world with online high scores. Part puzzle, part word creation, and all fun. Clear the board by creating words. As you pop each word from the grid, there are fewer and fewer letters left. Plan ahead to win the round and the game! 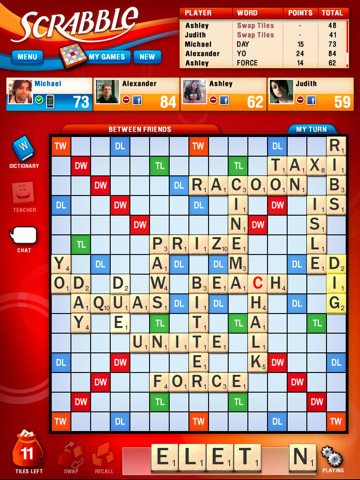 Kieffer Bros have built and refined four utterly addictive word games into Abca. Foremost, there’s Quest. Quest is nothing short of an adventure. 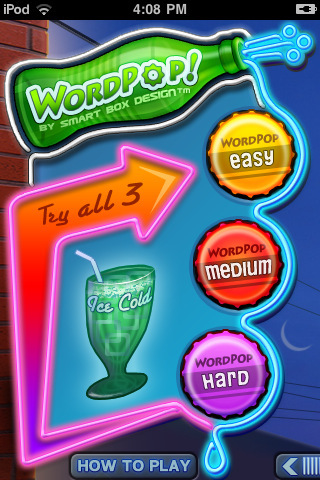 Trace words, collect gold letter tiles, rack up points, and advance to levels of ever-increasing lexical intensity. On your journey you’ll have to disarm bomb tiles, eradicate virus tiles, unfasten lock tiles, and try to predict the whims of constantly changing letter-switch tiles—all in a spellbinding effort to amass your precious gold. Scrabble players, break free from your border confines and venture onto the endless world of WordSnake. And for a limited time you can get this groundbreaking new word game at the introductory offer of 67% off the list price. Moxie is all about transforming words into new words. You start with a hand of 52 letters that you go through “Solitaire” style. Place each letter on the board or “Pass”. If you “Pass” you can’t go back to that letter. 2. Transforming your words into other words by adding and replacing letters. 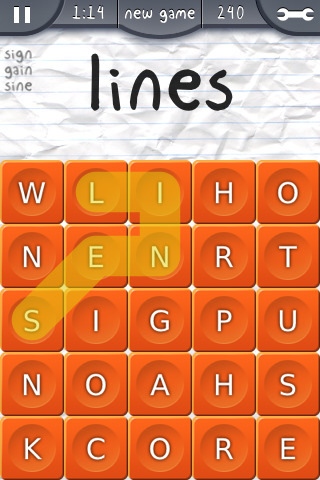 For example: “TIN” becomes “TINE” which becomes “TILE” which becomes “TILED” and so on. Once you spell a word and start transforming it into other words, don’t break the word chain! That’s a “Twaddle” and you’ll lose points. There’s no time limit and while it helps to know a lot of words, Moxie will more greatly reward those who like to think strategically. OneTuner Pro Radio Player for iPhone, iPad, iPod Touch – tunein to 65 genre stream!